Luxury rentals attempt to triumph one another with bigger, better and swankier amenities. It’s a game of cat and mouse between designers and developers, the great battle of style versus functionality. The Livmore caters to those pursuing the condo lifestyle with outdoor space. Furthermore, with its central location in Toronto, there are lots to see and do including fine dining, shopping and entertainment. As a result, the combination of amenities and location make for city living at its finest. Designed and built with 43 stories, the developers concentrated most of the residential amenities on the 5th floor. The dedicated areas include a game room, theatre, outdoor dog area, fitness area, and an outdoor terrace. 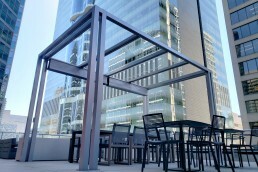 The spacious outdoor terrace overlooks the bustling streets of Toronto. It consists of places to lounge by a fireplace, barbeque for guests and a distinctive children’s play section. 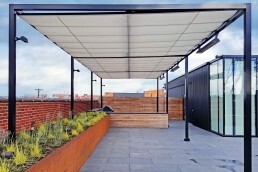 Keeping a close eye on the details, LandArt Design specified retractable shades for added weather protection. LandArt Design is especially unique, thoughtful and innovative. In fact, they have established their reputation through appealing and powerful designs in a wide range of projects. The skilled team found a way to help The Livmore residents make the most of their time outdoors. LandArt proposed a couple of unique dual-post, dual-beam structures. Up to the challenge, ShadeFX customized structures to match the design, while providing a turnkey solution. From engineering stamps to installation, ShadeFX was part of every step through the journey. 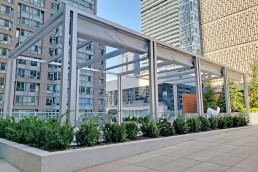 Covering two separate outdoor areas on the 5thfloor, ShadeFX customized two unique structures and six corresponding canopies. 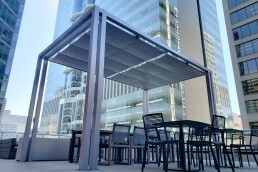 The ShadeFX Service team erected a ‘white aluminum’ structure above the dining area with two 10′ x 8′ waterproof canopies. The children’s play area also had a four-bay structure built overhead. 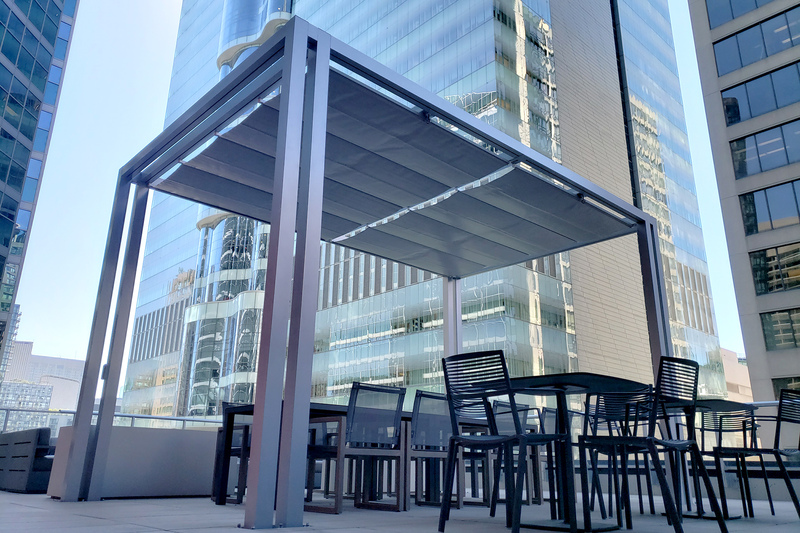 Additionally, the service team mounted four 16′ x 10′ manual canopies tasked to protect delicate skin or allow subtle sunshine. Thorough, responsive, and accommodating, the team at ShadeFX was always a pleasure to work with and were able to deliver a superb product with attentive service along the way. 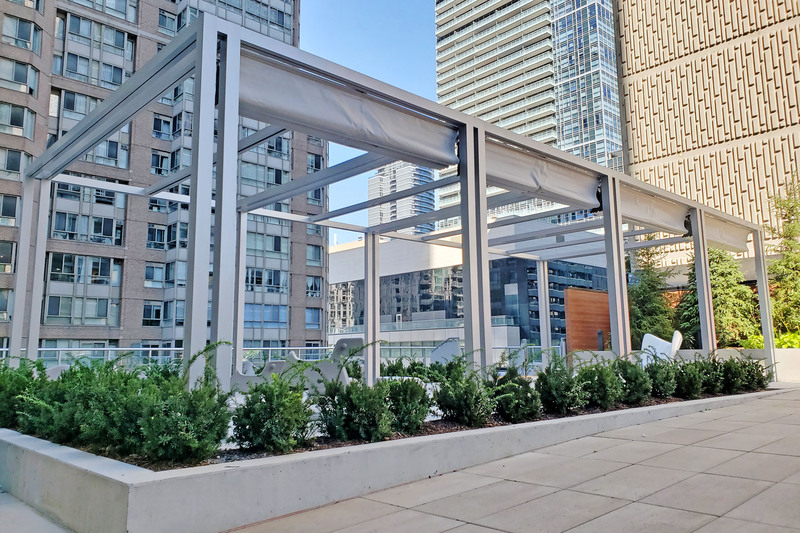 We are pleased with the excellent level of craftsmanship, the fine tolerances in detailing, and the ease of operation for the retractable canopies. They were able to deliver exactly what we were looking for and installation was seamlessly coordinated with the multiple other contractors and trades located on site. Desiring the perfect balance between practicality and eye-catching, The Livmore found just that with their amenities, both indoors and out. 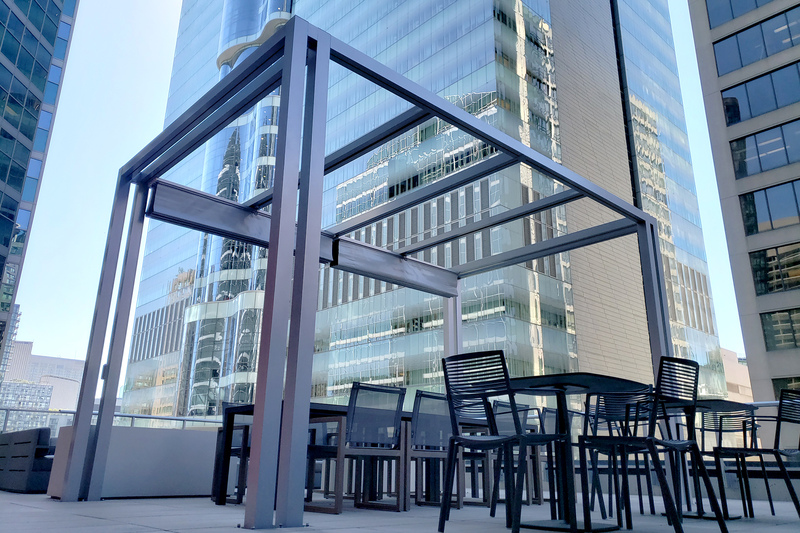 Enhance your outdoor amenities. Contact us today. 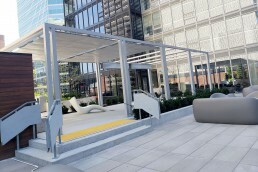 The Livmore’s spacious 5th floor outdoor terrace features unique dual-post, dual beam structures proposed by LandArt Design which ShadeFX stamped and installed. 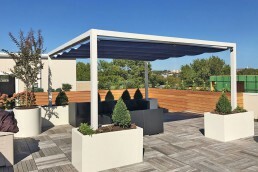 A four-bay structure with four 16’ x 10’ canopies were tasked to protect delicate skin in the children’s play area. 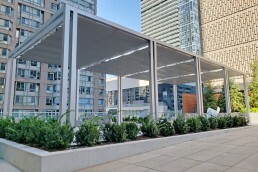 An additional pergola was built over the outdoor dining area with two 10’ x 8’ flame-retardant canopies mounted to the white aluminum powder-coated structure.